Back in 1973, a Lightweight Structures Laboratory had been set up at Ove Arup & Partners. It was a specialist group within Structures 3, the Arups team led by Ted Happold (Edmund Happold, 1930-96, later Professor Sir Edmund Happold). At the time, Rice was the associate analyst in Structures 3 and he joined the new team as chief designer. Ian Liddell (William Ian Liddell, b.1938) was the suspended structures and space frame expert. The Lightweight Structures group had been set up by Happold in association with architect Frei Otto (Frei Paul Otto, b.1925) and his team in Stuttgart, with whom Structures 3 had been working on the Mecca Conference Centre and Hotel (completed 1974), designed by Otto and Rolf Gutbrod (Konrad Dietrich Gutbrod, 1910-99). Otto is the guru of lightweight structures. Among his many achievements is the major breakthrough he made in the design of tensile structures in his early work, through his experimental approach and perserverance with the model-making techniques he devised. He was also first to propose a grid shell system (double-curved convex surfaces) generated from a notional freely-hanging chain grid — which he used for Mannheim Multihalle (1975). Happold had formed a close association with Otto and they would continue to work together for the rest of Happold's career. The Mecca project included several suspended cable roofs, the largest of which spans 46m in a single curve over an auditorium. Constructed from a triple sandwich of timber, insulation and corrugated aluminium supported by steel cables and stiffening members, the auditorium roof was still the "lightest heavyweight" roof of its type as late as 1997. The steelwork stiffens the cable network in one direction but the roof behaves like a lightweight structure in the non-stiff direction. Structures 3 undertook the computer analysis needed for the geometry. Through contact with Otto and the work of the Lightweight Structures Laboratory, Rice was starting to understand the non-linear behaviour of tensile structures — large deflections can change the geometry of the whole structure without actually breaking it. Otto was working with direct-force structures, never forcing a form for architectural effect. His experimental approach and focus on cycles of model testing had a big impact on the engineers at Structures 3. Arups was, and still is, the kind of place that invests in research and values innovation. Throughout his career, Rice would rely on the opportunities Arups gave him for the investigation and probing of ideas, and for working with the many talented people that the practice brought together. His later explorations into the possibilities of various materials, trying to find optimum ways for each to reach new expressions of their structural potential, had a surprising amount of support, despite conceivable cost and programme implications. As he became more confident and achieved project successes, his instincts and preoccupations would become definite assets. The year 1973 was also the year that Rice became Arups' director of the Centre Georges Pompidou project and moved to Paris. 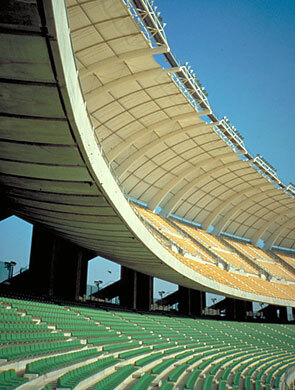 He had been working on the structural design from London since the competition win in mid 1971. The project consumed the major part of his time for a further four years and would bring him to the attention of architects all over the world. Although Happold left Arups in 1976 to take up a university post (and found his own firm), taking the connection with Frei Otto with him, the practice maintained its expertise in lightweight structures. Sometimes working with his own Paris-based practice RFR, and sometimes with Arups (or with both in association), in later years Rice would explore the possibilities of working with tensile structures in depth. Fabric was one of the materials he would investigate thoroughly. A good demonstration of Rice's continuing involvement is the detailed article he wrote for Vol.15 No.3 of The Arup Journal (1980), entitled Lightweight Structures: Introduction. He defines lightweight structures as "a group of surface structures made from fabrics or tension or compression nets". Such fabrics or nets are "the lightest available materials with adequate structural properties to span in two directions". To achieve a successful tensile structure that won't flap in the wind or destroy itself under irregular loading, the fabric must have anti-clastic curvature at all points on its surface. This can be defined as: when the curvature measured in a cross-section taken at any point on the fabric is opposite to the curvature measured in a perpendicular cross-section taken at the same point. Most of the fabric structures Rice worked on were made of Teflon-coated glass fibre (known as PTFE), which is a long-life building material. Shapes need to be defined accurately to achieve the even prestressing required. In his book An Engineer Imagines, he emphasises the visual importance of the seams. He used double seams at the joints, which throw shadows and so give articulation to the structure, which would otherwise be hard to perceive, given that PTFE is translucent. In 1981, Rice began work with Pompidou Centre architect Renzo Piano (b.1937) on the renovation of the Schlumberger headquarters in Montrouge, France (engineer: RFR in association with Ove Arup & Parners). The project includes 15m by 100m long tent over the garden entrance. Flying masts are used to support the fabric from below and create the anti-clastic surface. The fabric is pulled taught against two flanking buildings, the seaming running longitudinally to provide visual continuity. 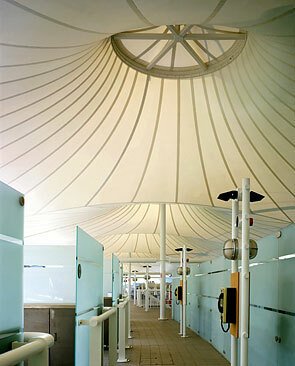 For the tented roof of the Lord's Mound Stand in London (1985-7, architect: Michael Hopkins & Partners, engineer: Ove Arup & Partners), coated PVC was used for reasons of cost. The architect chose radial seams for each of the conical tents that make up the whole, every second one supported by a mast. The ambience of the space created is governed by the articulation of the structure. However, in his book An Engineer Imagines he states that, "... as an object in space, fabric has very little physical presence". He was looking for a way to give physical context to a fabric structure. He was introduced to J.O. Spreckelsen (Johann Otto von Spreckelsen, 1929-87), architect for La Grande Arche (La Défense) in Paris, who asked him for help in developing the fabric structure now known as Nuage Léger (1986, engineer: RFR in association with Ove Arup & Partners). La Grande Arche is essentially a hollowed-out cube of government offices, 110m high and constructed in prestressed concrete clad in glass and marble. It completes the line of historical monuments that runs through Paris, echoing the Arc de Triomphe. Sprekelsen had envisaged planes of glass in the immense volume of the arch void but these proved impossible. Here was a great context for Rice. Spreckelesen resigned and his place was taken by architect Paul Andreu (b.1938) of Aéroports de Paris, who Rice and RFR would later work with on the TGV/RER Station roof, Charles de Gaulle Airport (1988-94). The position of La Grande Arche is very exposed and the wind loads extreme, as the building creates a wind tunnel effect. Rice felt strongly that the nuage (cloud) should be more that just a sheet of fabric, that it should have body and depth, and that philosophically the response to the physical conditions should be expressed. Working with Andreu, he pursued the idea that the fabric and its network of cable trusses together "... represented a physical volumetric presence similar to that of a real cloud" (An Engineer Imagines). The nuage is broken down into a series of sails, punctuated by circular glass discs at the suggestion of Rice, so that people could see the arch above. The seams radiate from each disc, emphasising it, and articulating the panelled form of the membrane to give it human scale despite its size. Flying struts stress the membrane against the network of cable trusses. In 1984, Rice was appointed a Board director at Ove Arup & Partners — he was now senior management. His large Arups workload was made possible by the young able graduates the practice employed. He appreciated this very much, and they appreciated him. For Jane Wernick (b.1954), he was a mentor. Looking back in 2012, she said, "What I liked about Arups was that the engineers read books". Wernick later worked on the London Eye, and went on to set up her own practice. 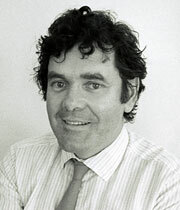 Tristram Carfrae (b.1959), who joined Arups in 1981 as a graduate, worked with Rice in the Lightweight Structures Laboratory team. He worked on many major projects with Rice, completing the Pabellón del Futuro after Rice was unable to continue. He is now an Arup Group Board Director. In 2012, Carfrae commented, "I am the person I am now because of Peter. He taught me about design ... [he showed me] how to be brave." Inevitably, not everyone found his determination to pursue ideas to their very ends easy to work with. But he did have the happy ability to instil confidence in those around him to push their own work further. He also understood what's important to creative designers. Architects and engineers alike responded to his optimistic view that a solution could be found to every problem. Lord's Mound Stand (1985-7) at Lord's cricket ground in central London. Rice engineered the coated PVC tented roof structure over the stand. Stadio San Nicola in Bari, Italy (1987-90) — a combination of precast and in situ concrete with a fabric roof covering. To help bring the scale to something more manageable, the fabric is divided into radiating segments round the oval-plan stadium.